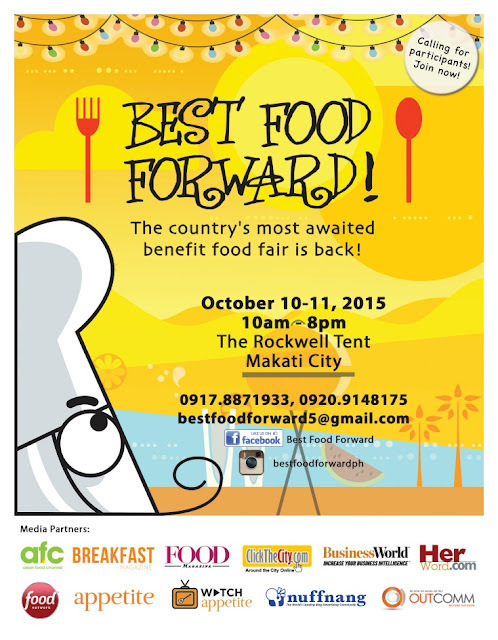 For more information, call 0917.8871933 / 0920.9148175 or email bestfoodforward5@gmail.com. A well-loved celebration of food, Best Food Forward has continuously gathered family, friends and the bustling culinary industry over the years, promising much more since its launch in the summer of 2011. A grand and fun food-filled weekend awaits and to celebrate this milestone, there will be over 100 specialty food concessionaires, innovative cooking demonstrations, celebrity chef appearances, family and children’s attractions, celebrity guests and many more! Best Food Forward is supported by the following media partners – Food Network, Asian Food Channel, Appetite magazine, Food magazine, Breakfast magazine, BusinessWorld, ClicktheCity.com, Watch Appetite, Herword.com, Nuffnang, and Outcomm.